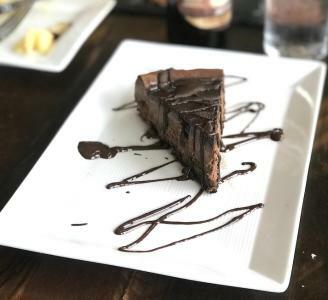 Some of my choices for the best OBX restaurants may surprise you. They aren’t very expensive and most are pretty casual, as it should be when taking a beach vacation. 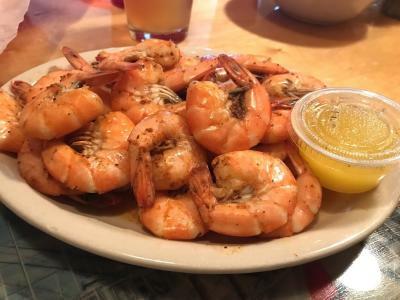 Many have a dress code of flip-flops and shorts (ie; no dress code at all) and they all offer my favorite thing about an Outer Banks vacation: fresh seafood! I was invited to experience a little of the Outer Banks food scene earlier this year. I had actually been to OBX many years ago. Since then, so many Outer Banks restaurants have sprouted up. 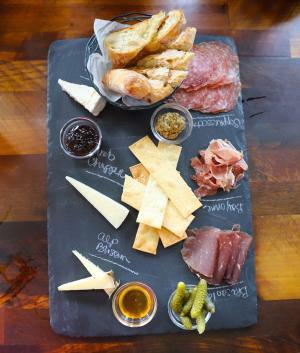 Who knew the Outer Banks had become such a foodie town? These are only a handful of spots I found while in the Outer Banks. With hundreds of places to choose from, you won’t have trouble finding delicious food wherever you end up in this beautiful beach destination. Back in 1874, Caffey’s Inlet Lifesaving Station No 5 was one of the original life-saving stations. The North Carolina coast was treacherous, and eventually, 20 stations lined the coast from the Virginia line. Of course, back then, it wasn’t swimmers being saved, but shipwreck victims. The first building burned down and was replaced in 1899. As the Coast Guard took over in 1915, the Lifesaving Station was eventually decommissioned. Lucky for us, the Lifesaving Station at the Sanderling Resort has been renovated a couple of times and is just beautiful. Take a walk around to see learn a little about the history of the building, and see some of the pieces on display. 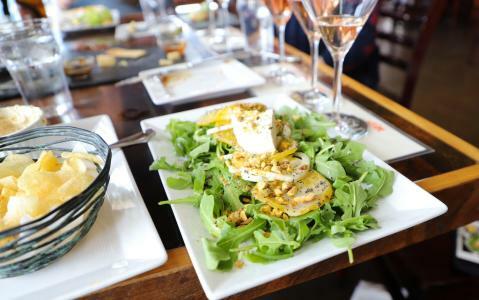 This casual restaurant serves southern coastal dishes using as many local and organic products as they can find for breakfast, lunch, and dinner. The Lifesaving Station will please everyone in your group. The menu is full of comfort foods like fried chicken and biscuits as well as seafood dishes like seared sea scallops with caramelized leek polenta, heirloom carrots, with drizzled balsamic glaze. So good! Word on the street is that you’ll also find the best breakfast in OBX at the Lifesaving Station. They also offer an a la carte Sunday brunch. 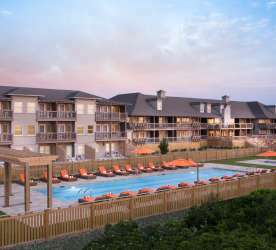 There’s a reason Condé Nast voted Sanderling the Best Resort on NC coast. Though you will find regular items always on the menu, the specials are seasonally based on what’s fresh. 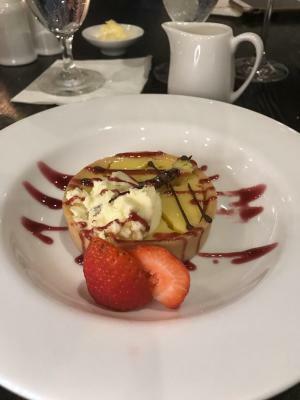 This lemon tart was wonderful! Sam & Omie’s is where to go for downhome OBX food. It’s fitting that the restaurant was originally opened in 1937 by a couple of fishermen. There was a need for an early morning breakfast spot for the guys heading out to fish, and 70 years later, Sam & Omie’s in Nags Head is still filling that need for locals and visitors alike. If you love seafood and you’re there for breakfast, just go ahead and order the crab benedict. Don’t even look at the menu! If you can’t help yourself, be prepared as there are a LOT of choices! 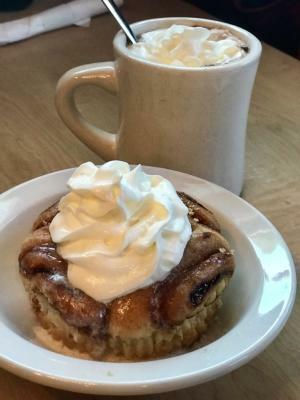 You really have to order the cinnamon bun, too. Share it with the table as it’s large and if you order it for yourself you’ll probably eat the whole thing. It’s that good! You may have to wait for a table, but the bartenders or waitstaff are happy to get you a cup of coffee or a cocktail while you drool over the plates as the trays pass you by. Whether you’re in the mood for breakfast, a burger or sandwich, or heartier fare like prime rib or a heaping plate of local seafood, you’ll be happy you ended up at Sam & Omie’s. Diamond Shoals Restaurant is open for breakfast, lunch, and dinner, and is the perfect spot for a meal after or before visiting the Cape Hatteras Lighthouse. Order a cold local beer to start. Diamond Shoals is famous for seafood. Choosing between a crab cake or a pound of shrimp is hard. The clam chowder is award-winning, and Diamond Shoals has the only sushi bar on Hatteras Island. Take a look at the Fresh Catch chalkboard to see what’s available. If it’s not fresh, you won’t find it at Diamond Shoals. It’s easy to see why people keep coming back year after year. Open seven days per week, Diamond Shoals also has an extensive kids menu. Don’t forget dessert! Blue Moon Beach Grill feels like a local hangout but offers a delicious menu. You may notice the menu says they will only offer carry-out if the restaurant is not busy. Instead, they encourage guests to come in, have a seat, and eat their food hot, fresh from the kitchen, the way it should be served. They want to give you a “Once in a Blue Moon” dining experience. The menu offers so many great choices, like shrimp and grits, filet mignon, and the ever-popular Truck Stop; envision a pan-fried pork loin with a large portion of skillet potatoes and onions topped with homemade pan gravy. Want to take it up a notch? Add a fried egg! Watching the different dishes come out of the kitchen made me wonder if I had ordered well. Once my food came, I knew I had made the right choice. The bouillabaisse was heavenly, with big pieces of local fish and shellfish bathed in a slightly spicy, saffron and white wine tomato broth. Walking into Waveriders is like entering the set of Friends. From the website: Grab a menu, order at our register area and find a place to crash. You’ll instantly relax and the menu offerings will satisfy just about any craving. Looking for breakfast? 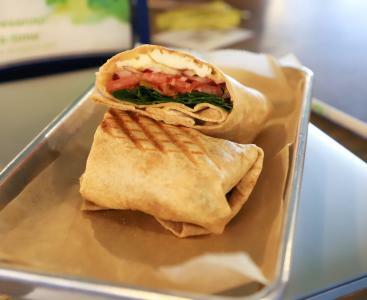 Order the Eddie; egg, smoked Gouda, tomato, onion, avocado, balsamic drizzle on a panini pressed everything bagel or one of their creative breakfast wraps. Pair it with the latte of the day or the Bikini Bottom Smoothie of pineapple, cucumber, and honey. More in the mood for lunch? Build your own deli sandwich or try the Beet & Gorgonzola Salad Special. Grab a freshly baked pastry for dessert. Waveriders is open every day and online ordering is available if you’re in a hurry or want to grab and go. With 9 craft beers on tap, you might want to eat in and stick around for a while. I first discovered Lost Colony Brewery at the Seafood Festival. Visiting the actual brewery wasn’t on my agenda, but how could I pass by without stopping in? 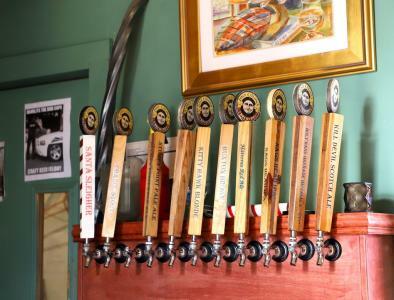 Located on Queen Elizabeth Street in downtown Manteo, this brewery has a fun atmosphere and brews eight different beers. 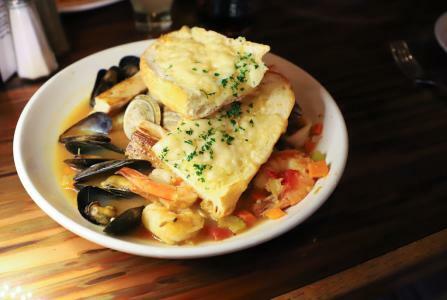 While you’re there, check out the menu of classics like Shrimp and Crab Au Gratin or Surf and Turf. Not ready for a big meal? The appetizer menu offers starters like baked brie with toasted almonds and apples, served with a toasted baguette. With four locations, you’ll probably run into a Big Bucks Ice Cream Shop while vacationing in the Outer Banks. This cone of deliciousness came from the Manteo waterfront location, which I highly recommend. Take a walk and savor the goodness. All the ice cream, sorbets, and sherbets are made from scratch, and though some flavors are seasonal, you’ll always have a lot to choose from. Try the butter pecan, chocolate hazelnut, or choose from this crazy long list! The cookie dough was pretty Instagrammable! You can also order an espresso, smoothie, or a box of homemade chocolates to go. Big Bucks also makes custom cakes for any occasion. Online ordering is also available for gift boxes of their chocolates. When you see a sign that says award-winning wines, you really should take a minute to stop in, just to see if it’s true. 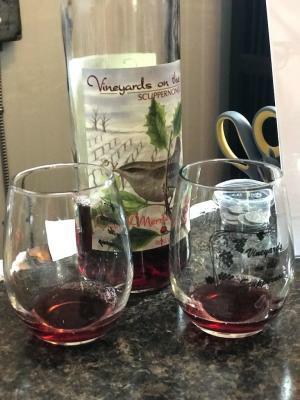 Tasting is believing, and Scuppernong Vineyards would love to pour you a tasting of a few of their varieties. Their complimentary tastings include 1/2 ounce pours of their most popular wines. With the tasting, you’ll learn a little about each wine, as well as suggestions for food pairings. The Outer Banks Brewing Station is a must stop when in OBX. It’s the perfect location for this brewery and restaurant designed to be a modern rendition of a turn-of-the-century Lifesaving Station. How often do you get the chance to visit a wind-powered brewery? Take a brewery tour, or just stop in to take a look around and try one of their eleven handcrafted beers on tap. 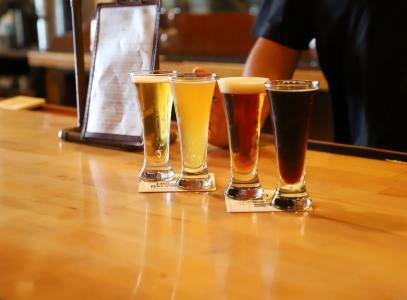 You can also try four 5-ounce beers in a flight – the best way to get a feel for what they are brewing. 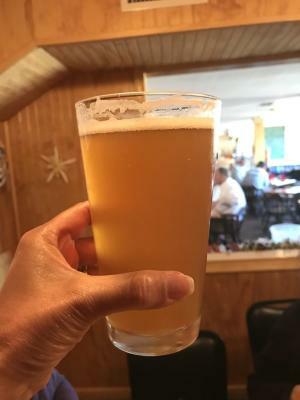 A good time to go is when you’re hungry as Outer Banks Brewing Station has a fun menu with a myriad of choices. Starters include wings, shrimp, and Jalapeno Bottle Caps, perfect with a cold brew. The lunch menu offers more salads and sandwiches, and the dinner menu gets a bit fancier, with entrees like seared scallops and local beef specials. Vegetarians will be pleasantly surprised to find a lot of choices, too. Another great spot to have a cold brew is Captain Andy’s Oceanfront Tiki Bar and Grill. With 30 beers on tap, they offer the biggest selection on the beach. Sit outside and get some sun or grab a table inside to cool off. The views are pretty spectacular! Order the Nachos Supreme with or without beef or chicken. It’s definitely sharable! The calamari is delicious, served with marina sauce on the side. If you’re hungry for a meal, Captain Andy’s offers quite a few seafood platters and a plethora of sandwiches. It’s quite a menu! Owens’ Restaurant is a must when you’re planning to eat at the best OBX restaurants. A landmark since 1946, Owens’ is the oldest restaurant you’ll find in the Outer Banks that is still owned and operated by the family who founded it. 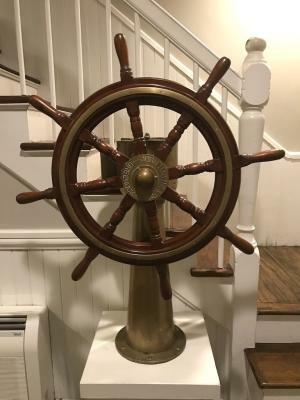 Take a walk around and check out the museum quality artifacts that are part of the Outer Banks maritime history. You’ll really feel like you’ve gone back in time! And wait until you taste the delicious food that makes Owens’ Restaurant so popular. Rich coastal cuisine featuring the “bounty of the Atlantic.” The best and freshest ingredients available are delivered from regional farmers, and the freshness shows in every bite. 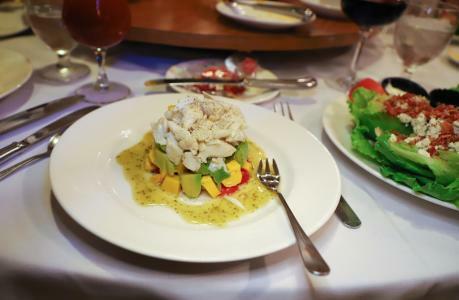 Try the Crab Stack, with jumbo lump blue crab, mango, tomato, and avocado. So good. For the seafood lover, you’ll be glad you ordered the Shrimp and Grits. Rather try that Certified Angus Beef? You’ll have a lot of choices, from the ribeye to the filet mignon to prime rib, slowly roasted and finished on the grill. Owens’ also offers chicken and pasta dishes. There truly is something for everyone. All meals are served with the delicious cheese crock and crackers as well as Owens’ famous hushpuppies. Save room for dessert! Your server will let you know what’s on the menu. In the mood for a freshly baked donut? 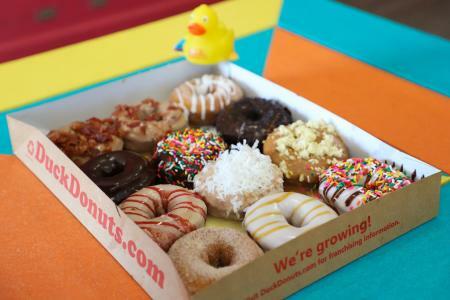 You’ll have your choice of twelve different flavors at Duck Donuts, the fastest growing donut shop in the US! If you can’t find a flavor you love out of these choices like Vanilla Icing with Toffee Crunch and Chocolate Drizzle or Peanut Butter Icing with Chocolate Sprinkles, ask to make your own Duck donut! All donuts start with vanilla cake, and you choose the coating, topping, and drizzle! You’ll also find limited time specials depending on when you visit. Order a coffee to enjoy with your donut and remember to take a box home! You’ll find the freshest seafood available at ONeal’s Sea Harvest. Located right on the Wanchese harbor, this seafood wholesaler is where many of the restaurants in the Outer Banks get their seafood. Fortunately for the public, ONeal’s handpicks a selection from their daily catch to sell to consumers. You can also purchase a variety of fresh or frozen seafood including fish, hard and soft-shell blue crabs, and North Carolina shrimp and ocean scallops. There’s also a restaurant if you’re not in the mood for cooking (you are on vacation!) serving a variety of seafood and sandwiches, as well as dessert. Lunch is available from 11-3:30. ONeal’s is not open for dinner as the store closes at 5 pm. The four owners of Outer Banks Distilling met years ago working at a local brewery in Kill Devil Hills. Over beer and rum, they became friends, which led to discussions about starting a craft distillery on the Outer Banks. Between them, they had brewery and bartending experience to start them on this new adventure. 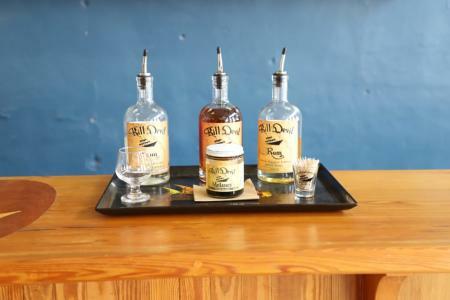 Lucky for us, they became the first legal distillery on the Outer Banks, opening in February of 2015. In May of that year, their first batch of 720 bottles sold out in four hours. When you taste it, you’ll see why. Their flagship rums are Kill Devil Silver, Kill Devil Pecan (which I bought to bring home to my husband), and Kill Devil Gold. Inquire about their limited edition Shipwreck Series, each named after a shipwreck, and available periodically. The Solspice Series comes out twice a year for the winter and summer solstices. Finally, the Angels’ Share Rum is a unique small batch where all the proceeds are a fundraiser for a local project. Visit Outer Banks Distilling at 510 Budleigh Street in Manteo. The last Outer Banks restaurant I went to ended up being my favorite. Part of the reason is that Trio has such a great appetizer menu. I’ve said before that I could live on appetizers, and their Charcuterie Board is to die for, filled with a selection of cured meats. There’s also a cheese board. Another reason I loved Trio was their extensive wine list. Try the Rosé flight. It pairs perfectly with the Pear & Beet Salad of fresh red pears, roasted beets, fennel, and topped with Humboldt Fog goat cheese, toasted pistachios, and their honey poppyseed vinaigrette. The onion dip is also so wonderful, but don’t ask for the recipe. They aren’t sharing. Sorry! You’ll also want to save room for the dark chocolate goat cheese cheesecake. Take a walk around the retail store and you’re sure to find ingredients you haven’t seen before. If you find something that will help you recreate that onion dip, please let me know! Though these aren’t restaurants, food lovers won’t want to miss visiting Hatteras Saltworks or the Outer Banks Seafood Festival. 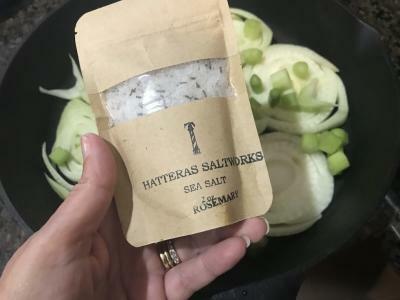 Brian, Shaena and Declan McMahon of Hatteras Saltworks have been trying different methods of producing sea salt for years. They’ve studied crystals and evaporation methods from the Caribbean to the Pacific, and back to the Atlantic Ocean. Finally settling on Hatteras Island, they now produce a clean mineral-rich ocean salt. 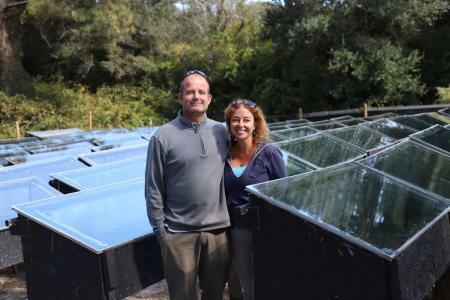 Take a tour and see for yourself the solar oven process they’ve created, using 550 feet of pipe to get the salt water. It’s amazing to see! Take some salt home and taste the difference. I bought a few bags and have it in my salt shaker on the kitchen table and I’m using the rosemary salt for seasoning when I cook. It’s delicious! Tours are by appointment only, so check out the website and make sure you visit when you’re in town. 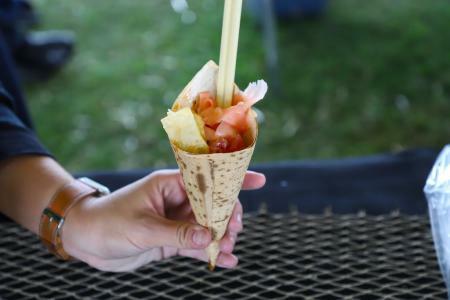 Finally, the Outer Banks Seafood Festival is a foodie event worth planning your vacation around. 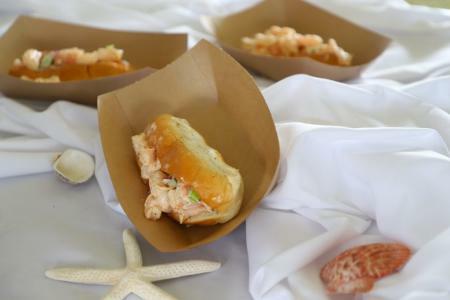 2019 will be the 8th year for this event where you can taste some of the best seafood on the planet. Eat, drink, and check out the displays celebrating the local fisherman who bring us the shrimp, fish, crabs, and other local seafood this area is known for. I guess living on the east coast all my life has made me conscious of the term OBX. 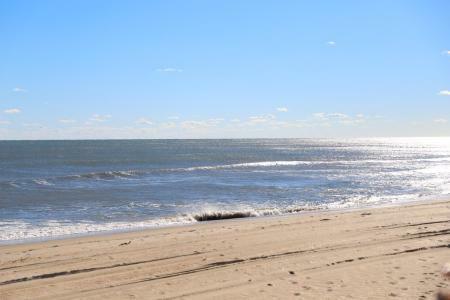 I was surprised when a travel friend asked me recently – what is OBX? 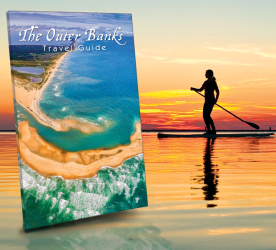 The chain of barrier islands located off the coast of North Carolina is known as OBX. Curious about how that came to be? I was, too! According to Coastal Virginia Magazine, restaurant owner Jim Douglas liked the European style stickers he saw on local cars and decided to make one up for the Outer Banks. He decided on three letters: OBX. The rest is history. For a beach lover like me, OBX is paradise. Driving the Outer Banks Scenic Byway is a road tripper’s dream, and you’ll find many miles of off-road beach driving, too. But with six towns and 12 coastal villages to explore, there’s so more than beach and food. But, oh, that beach! For golf enthusiasts, you’ll find six professional courses. Love to fish? Take your rod out on one of the fishing piers, book a spot on a charter boat, or try surf fishing. If History is more your style, visit the newly renovated Wright Brothers National Memorial and check out the four incredible lighthouses, all Instagram worthy! Up for a bit more adventure? Take a hang gliding lesson at Jockey’s Ridge. There’s really so much to do! You have a lot of choices when it comes to accommodations in the Outer Banks, but if you want to have plenty of room to spread out, be steps from the beach, have a private pool area with a hot tub, as well as have all the amenities of home, Whalebone Ocean Cottages located on South Old Oregon Inlet Road in Nags Head is the perfect spot. Have you decided on your next vacation? One thing is for sure, a trip to the Outer Banks will make everyone happy! 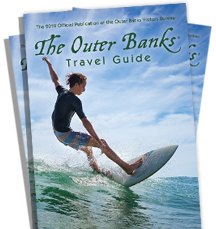 Visit the Outer Banks website to start planning.